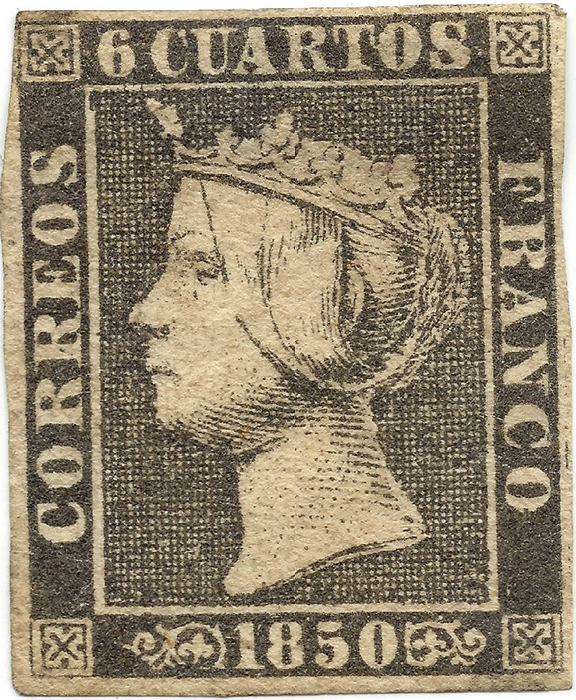 Printed by Fabrica Nacional del Sello (National Mint). The issue quantity for Spain Scott #1 is a total of all varieties of paper thickness and all types. 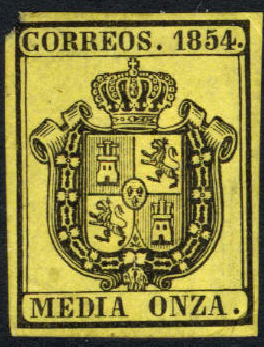 On October 24, 1849 a royal decree, signed by the Count of San Luis, ordered the creation of adhesive postage stamps to be used as prepayment for delivery of mail in Spain. Only two months later, on January 1, 1850 the first set of five stamps was ready and in use. They all show the portrait of Queen Isabella II. The 'Araña', or Spider, cancel often seen on the first issue was first used in Madrid on February 22, 1850. It was introduced in the rest of the country a few days later. The idea with the design of this cancel was to prevent the Queen from being 'de-faced'. Most often the cancellation ink is black, though red, blue and green are known to have been used early on. In 1851 the officially prescribed colour was black. This cancel was mainly used between 1850 and 1851, meaning only on the first issue. It seems to have been used occasionally in 1869 and 1870. The 'Araña' cancels could sometimes be removed and the stamps could be reused. The 'Araña' was therefore replaced by a heavier cancel, the 'Parilla', an oval with horizontal lines. When some people managed to remove this cancel it was prescribed to use oily ink. Full margins are relatively narrow at about ¾mm, similar to most other, if not all, imperforate issues of Spain. The design was not reused, and later issues were printed using typography. This should make it nearly impossible to mistake the first issue for a later one. A variety of shades are found on all the stamps. The 6 cuartos range from intense black to almost light gray. Stamps with a small hole punched through were used for telegraph service. They are usually worth considerably less than postally used stamps. Issued for the use of government departments. The first would have been an 1840 Penny Black variant with V and R (Victoria Regina) in the top corners, but this was never issued (although some got into circulation and are available at outrageous prices). First place therefore goes to Spain for an 1854 issue.